On Wednesday's fifth anniversary of the U.S. Supreme Court's Citizens United decision, Sen. Bernie Sanders (I-Vt.) filed a constitutional amendment to limit the role of money in politics. But he also used the occasion to build out his own email lists and lay the groundwork for a fundraising pitch, according to an email chain inadvertently sent to Seven Days. And in an exchange with campaign and Senate staff members planning the Citizens United anniversary, Sanders appeared focused on raising money from Washington, D.C., political action committees. "YES. Let's do it," the senator wrote his advisers, referring to a Citizens United-focused fundraising pitch. "How are you doing on the DC PAC fundraiser? Thanks. B." In the emails, campaign aide Nick Carter asked his boss to approve a collaboration between the Sanders campaign and Progressives United, a political action committee founded by former Wisconsin senator Russ Feingold. Together, Carter explained, the two entities would send an email on the anniversary of Citizens United asking supporters to sign a petition saying "Democracy's Not for Sale." Doing so, Carter wrote, would help "to grow our lists and send a message to legislative leadership to stand strong for progressive values." Later, Carter suggested, the Sanders campaign would return to those who signed the petition to ask for campaign cash. "After Action: small $$ donation to support groups/candidates that are fighting hard for progressive values in the face of corporate influence," Carter wrote in the email, dated January 7. Sanders responded less than an hour later, signing off on the idea and asking about a separate, "DC PAC fundraiser." According to spokesman Michael Briggs, Sanders was referring to "a small breakfast gathering on Thursday with long-time trade union supporters." An email Sanders sent supporters Wednesday in collaboration with Progressives United. What's Sanders doing holding a fundraiser with PAC representatives, given his outspoken opposition to such entities? "Like every other member of Congress, Bernie holds fundraising events, which is what he will be doing tomorrow in Washington," Briggs said Wednesday. "As a senator who does not accept money from corporate PACs, he depends as he always has on the support of trade unions, environmental groups, women’s groups and seniors’ organizations to support their political efforts." Isn't it a little cynical to use the Citizens United anniversary as a fundraising tool? "At a time when the Koch brothers and other billionaires are pouring hundreds of millions of dollars into the political process, it should not surprise anyone that Bernie and other progressives need to raise campaign funds. Until we move to public funding of elections, which Bernie supports, that is an unfortunate fact of today’s political life," he said. "Citizens United will go down in history as one of the worst Supreme Court decisions ever made," Briggs added. "It is undermining American democracy and allows big money interests to make huge contributions, much of it undisclosed. It is totally appropriate that Americans be asked to help out those elected officials and organizations who are standing up to policies being undermined by Citizens United. Bernie, whose average contribution is less than $50, believes that is not the same as a billionaire family like the Koch brothers contributing hundreds of millions of dollars." 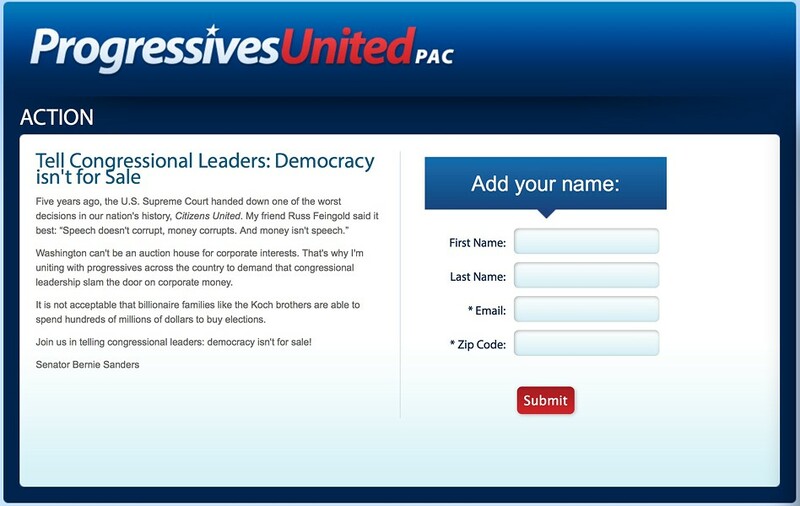 A Progressives United petition used by Sanders to gather email addresses for fundraising purposes. 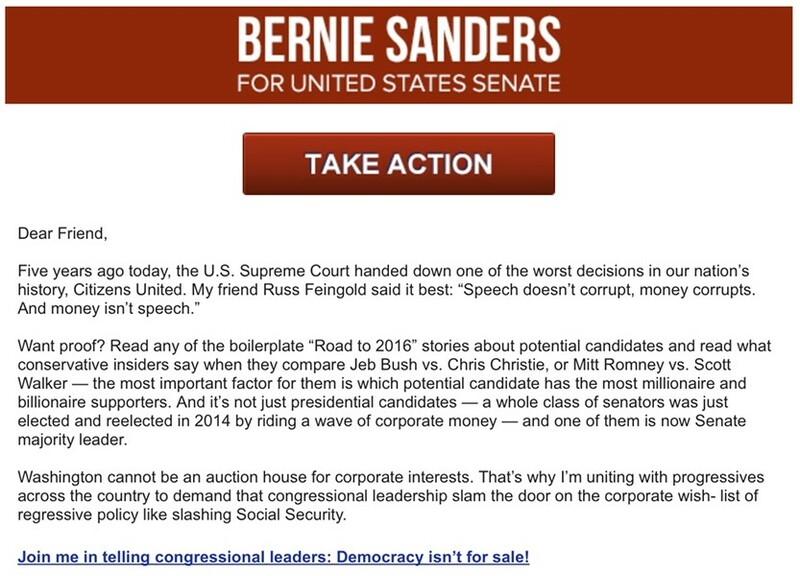 Sanders went ahead with the Progressives United fundraising letter, sending it to his supporters Wednesday afternoon. Copied on the emails between Sanders and Carter are three official Senate staffers: state director Phil Fiermonte, who also serves as Sanders' campaign manager, press secretary Jeff Frank and deputy press secretary Kenneth Pennington. Also copied, presumably by accident, was a Seven Days advertising executive whose name somewhat resembles Briggs'. 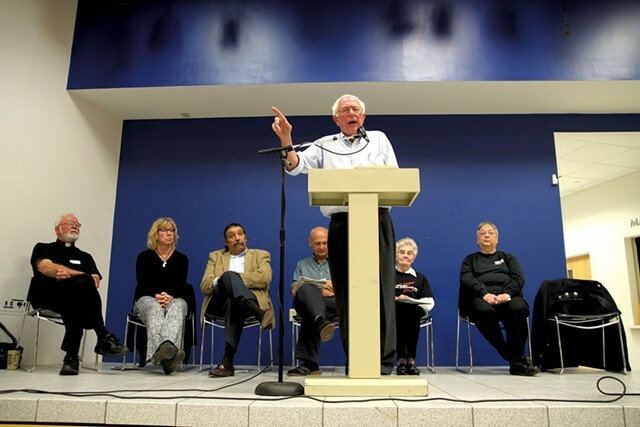 Should government-paid staffers be taking part in Sanders' fundraising activities? "The emails you asked about were sent to personal accounts, not official Senate accounts," Briggs said. "As you know, it is perfectly appropriate for congressional employees to be involved in unofficial activities on their own time. As public campaign finance reports make clear, Jeff and Kenneth are paid for work they do on their own time for the campaign. Phil and I sometimes volunteer our time, a commonplace occurrence." Sanders is currently mulling a run for president in 2016. He told the Associated Press last month that he will announce a decision by March.